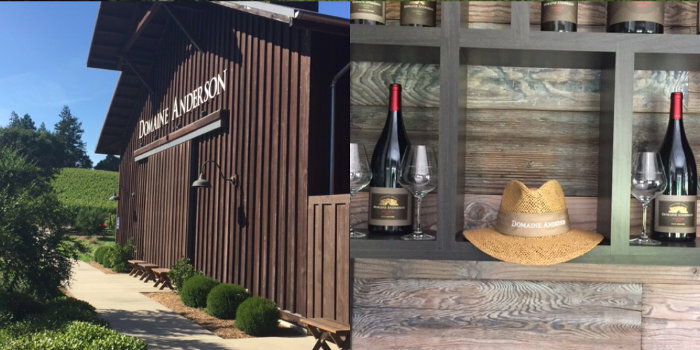 Earlier this week, Nick Hillman visited Domaine Anderson, Mendocino, California. A beautiful area producing excellent wines. Jerry Murray, head wine-maker, runs the estate on biodynamic principles. The winery is owned by Louis Roederer, who also have two other estates on the same road. Worth a visit if you’re ever in the area! Domaine Anderson is nestled in the breath-taking, fog-shrouded hillside and mountain terrain of the Anderson Valley. The Domaine is located near the small, pioneering wine growing community of Philo. The cooling marine layer and varied terroir, characteristic of this Northern California coastal region, provides the perfect conditions for the cultivation of Pinot Noir and Chardonnay grapes. These ideal growing conditions were what inspired Jean Claud Rouzaud, Chairman of Champagne Louis Roederer, to this remote corner of Mendocino County in the early 1980s. In search of the perfect vineyard sites in which to grow Pinot Noir and Chardonnay grapes, Rouzaud knew the remote valley’s sloping hillsides and cool climate would provide the optimal growing conditions to fulfil his vision – to produce world-class wines of the highest standards and distinction. Domaine Anderson’s vineyards span the Anderson Valley, from the warmer region of Boonville to the cooler regions of the Mendocino coast. The Domaine’s soils range from rocky, river gravels to the finest clay loam. All grapes are estate-grown, allowing Domaine Anderson complete control over the stewardship of their land.